ESI Group (Paris:ESI), pionnier et principal fournisseur mondial de logiciels et services de Prototypage Virtuel pour les industries manufacturières, annonce la sortie de la dernière version de SYSTUS, solution logicielle éprouvée pour la conception thermomécanique et les analyses réglementaires dans le secteur nucléaire. ESI SYSTUS 2017 apporte de nouvelles fonctionnalités majeures au logiciel, y compris une méthode différentielle innovante (RCCM-MD) pour les analyses règlementaires. Cette version 2017 apporte également des améliorations dans le domaine de la mécanique de rupture avec la méthode X-FEM. Outre ces nouveautés qui concernent le secteur nucléaire, cette nouvelle édition ouvre la voie au traitement de problèmes d’optimisation topologique, notamment dans les secteurs de l’automobile et de l’aéronautique. A high chromium (HiCr) iron work roll broke in three pieces in finishing stand 4 in a compact strip production (CSP) mill of a steel company. The paper describes the causes of the roll failure manufactured from high chrome grade steel along with the precautionary measure. A new article available online 10 November 2015 in « Case Studies in Engineering Failure Analysis ». A temporary threadbar used for precast segmental construction broke during the post-tensioning stage before reaching the service load. Failure analysis showed that the premature failure of the bar was due to the presence of an arc strike. The arc strike effects on the material and threadbar integrity are studied. Read more…. A case study published in « Case Studies in Engineering Failure Analysis » – April 2016. In this study, the fracture failure of the 4Cr13 stainless steel linkage components in circuit breakers was studied. The microstructure and morphology of fracture surface were observed by scanning electron microscopy and optical microscopy. A micro-Vickers tester measured the hardness of the components. The tensile strength and strain of the components were determined by a universal testing machine. 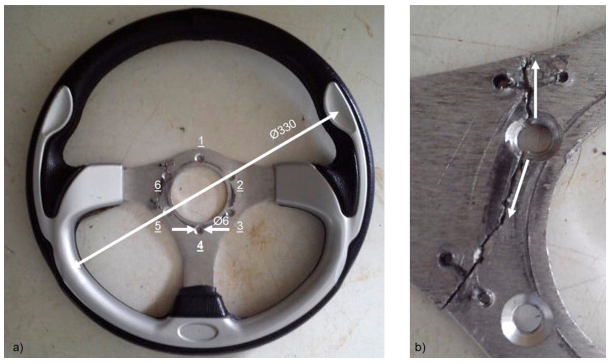 The results show that fracture failure mode was quasi-cleavage fracture, and some dimples and edges of cleavage were present on the fracture surface. An article about a case study published in « Case Studies in Engineering Failure Analysis » – april 2016. A temporary threadbar used for precast segmental construction broke during the post-tensioning stage before reaching the service load. Failure analysis showed that the premature failure of the bar was due to the presence of an arc strike. The arc strike effects on the material and threadbar integrity are considered. A new case study in « Case Studies in Engineering Failure Analysis » of October 2015. Tyre bead grade wire is used for tyre making application. The wire is used as reinforcement inside the polymer of tyre. The wire is available in different size/section such as 1.6 mm to 0.80 mm thin Cu coated wire. During tyre making operation at tyre Manufacturer Company, wire failed frequently. 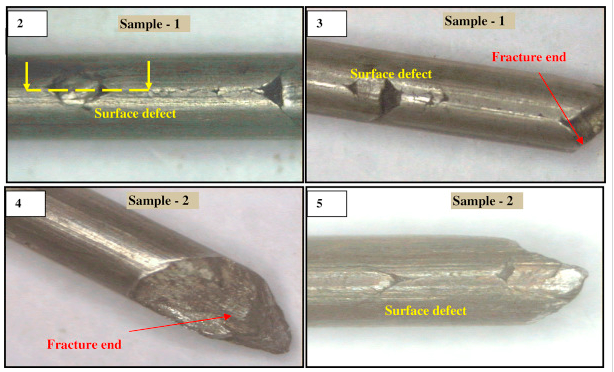 In this present study, different broken/defective wire samples were collected from Wire Mill for details investigation of the defect. The analysis revealed that, white layer of surface martensite was formed and it was caused the final breakage of wire. In this study they have also discussed about the possible reason for the formation of such kind of surface martensite (hard-phase).